Are you a beginner in web development with LAMP environment, or a CS/IT student overwhelmed with setting up LAMP and configuring it for your web-related academic project? If yes, then you are at the right place. We have discussed earlier how easy it is to setup a web development environment on your Ubuntu desktop. In this article we will try to have a more customized setup of this environment for easily working with multiple websites. Also find below introduction to some useful Apache utilities and configuration files on Ubuntu/Debian operating system. One of the ways to work on multiple sites is to put different directories under /var/www and access them as http://localhost/site1, http://localhost/site2 etc. but there is another and more elegant way. We can access our sites simply by pointing our browsers to http://site1/ and http://site2 etc. To find out how, follow the tutorial. Let’s keep all our development websites under the home directory in public_html folder. Apart from being easy to manage your website from inside your home folder, this has the benefit that you no longer need to use sudo to put files in your document root (/var/www earlier). 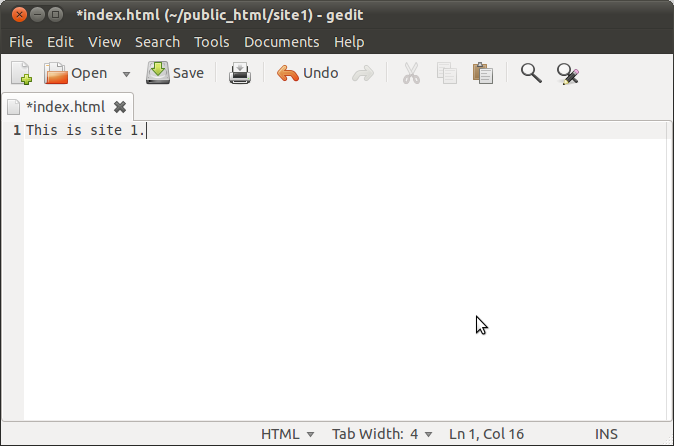 Enter some text such as “This is site 1” and save the file. 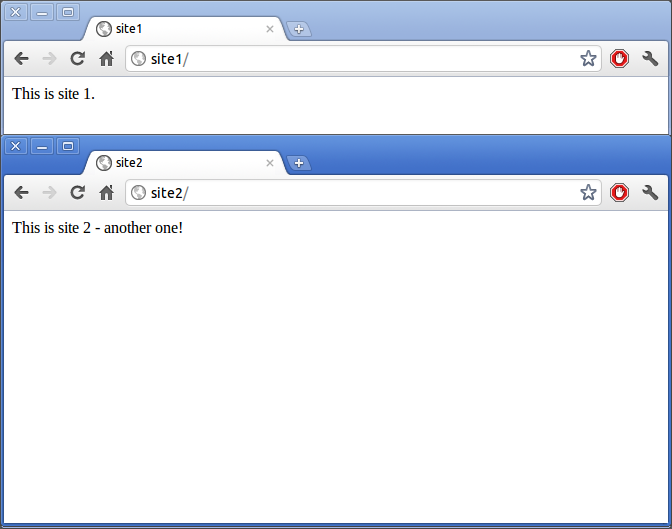 Similarly put “This is site 2” in the index.html of site2 directory. Note that I am using vim editor for making the changes as I prefer it for its amazing syntax highlight support even for various linux configuration files, you may use gedit, or any other editor instead. Save the file, similar changes need to be done for other sites also, site2 in this example. Now we need to make entries in the hosts file so that Apache can recognize the new sites. You can ignore the warning which is shown in the above output. Now open your favorite browser and open http://site1 and http://site2 in different tabs, you will find the content of their respective index.html files. 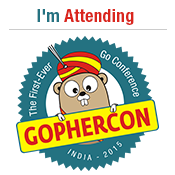 And now you are done with setting up multiple sites in Apache. You can create as many sites as desired by following the same procedure, creating a config file for each website. a2ensite – As we used this above, you already know what it does – enable a website among those available under /etc/apache2/sites-available directory. a2dissite – does exactly the opposite – disable a website so that it is no longer accessible from your web server. E.g. This will disable site2 from loading any more. You can use a2ensite to enable it again. Similar to sites, there are corresponding directories and commands for controlling apache modules also. Available modules are kept under /etc/apache2/mods-available directory and enabled ones are symlinked under mods-enabled directory. The corresponding commands are – a2enmod and a2dismod. E.g. 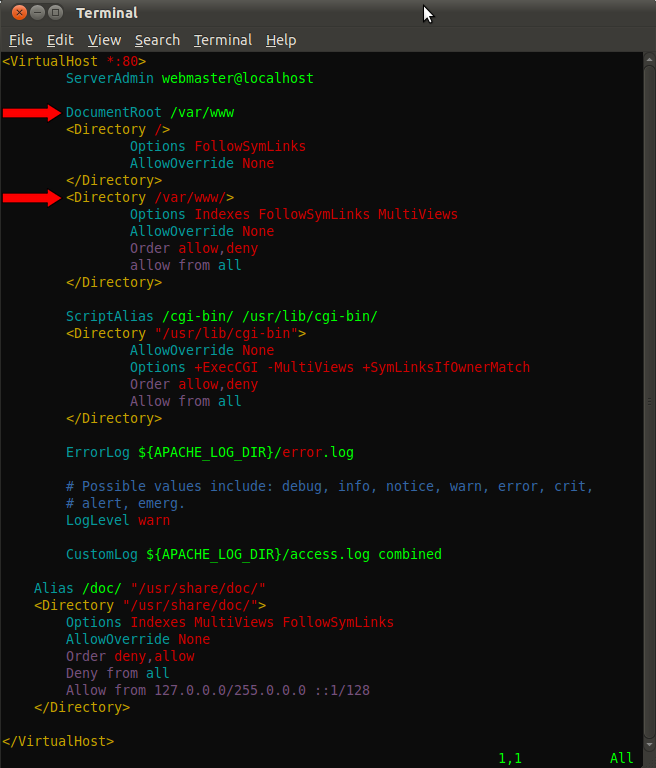 This will enable Apache rewrite module which is required my some CMS solutions like Drupal to enable pretty URLs. Hope this article was useful to you, feel free to ask your doubts, problems you face, or any similar tips you might have through comments. It might have been a problem of incorrectly configured DNS entries in the hosts file. Please elaborate your scenario more, I am unable to understand the situation clearly. What configuration need to do in order to make all these sites available through internet ?? From Apache’s side everything is ready. 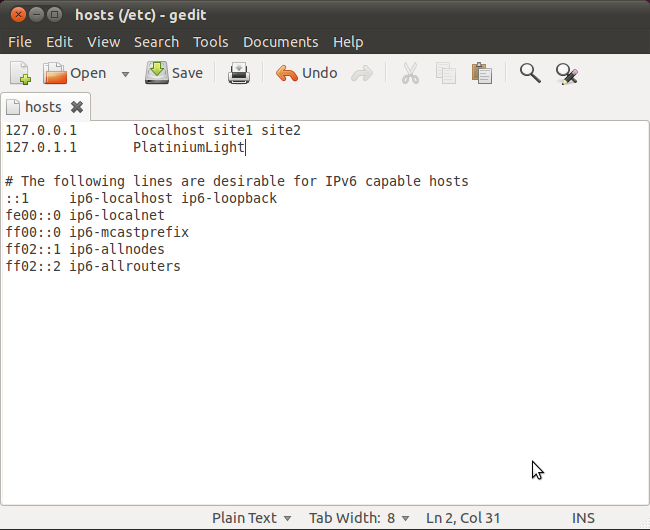 Additionally, you need to configure your DNS servers to point these new ‘names’ to your server. Hi Kartik. I know it’s an old post, but I’ve configured my sites the same way as you. But now I have a problem with mod_rewrite. One of my sites is a Joomla 2.5 site with SEF and URL rewriting enabled (site1). When I pint to http://site1 I get redirected to http://site1/en (its a multilingual site, it’s ok). But when I access any other site, for instance http://site2, I get redirected to http://site2/es and the contents of site1 are being shown. Whats happening? Can coexist more than one site, one with URL rewriting and another without it? Looks like your rewrite rules are in the wrong place. If you put them in .htaccess of site1 (instead of putting in apache’s config file) and access site2, I doubt it will ever redirect again to site1’s contents. Let me know, if this solved your problem. Thanks Kartik. I reviewed all the process and I have some sites with ServerName and some others without it, and maybe this was the error. Now it works fine, great! To make it perfectly work ! You are right. But is it absolutely necessary? I have tried this setup without ServerName directive and it works completely fine. 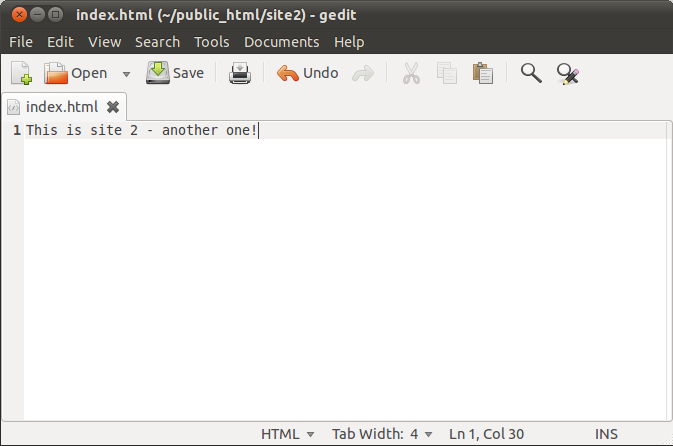 yeah but in my case (ubuntu 12.04) it keeps on redirecting me to index.html of /var/www withdout this ! 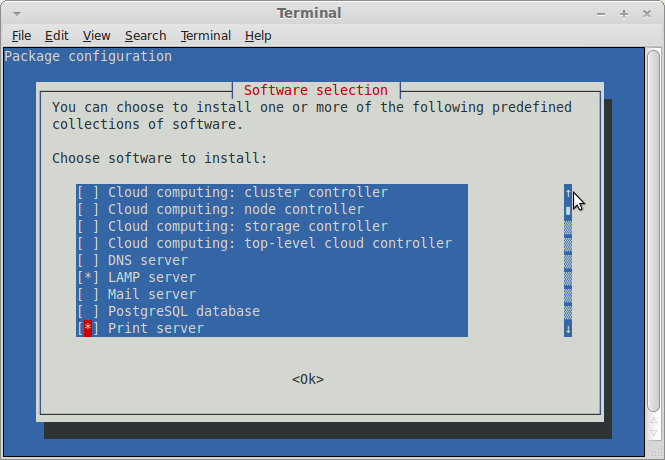 This will install a small utility which lets you install a lot packages grouped together as software collections. Launch tasksel and select ‘LAMP server‘ by pressing the SPACE key, press ENTER when you are done (see attached screenshot). It will take some time for the required packages to download and install. Near the end of setup, the installer will ask you to create a password for MySQL‘s root user. After the installer finishes, you have the environment ready. 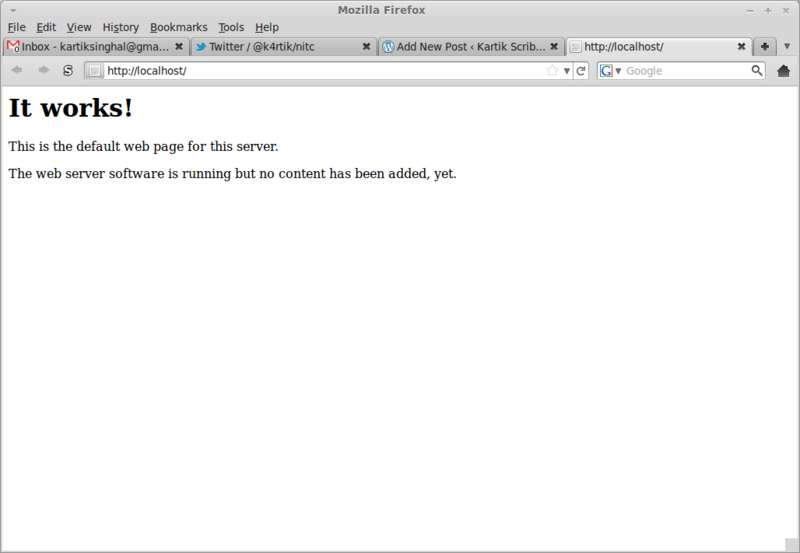 Head over to your favorite browser and open http://localhost If everything went fine, the page will say It works! Now you can start creating websites by putting your html, php, etc. files under /var/www directory or just choose to go with CMS solutions like Drupal, WordPress or Joomla. The author also recommends to install phpmyadmin package if you happen to work with MySQL databases.